Yankees No. 16 prospect Thairo Estrada was shot last month in Venezuela but is expected to fully recover and play this season, the team revealed on Friday. Estrada, a 21-year-old infielder, was shot in the right hip by teens in an attempted robbery in late January, according to Yankees manager Aaron Boone. Boone said the Venezuela native was doing better and is planning to play the majority of the season, according to MLB.com's Bryan Hoch. Estrada, Hoch said, was entering a restaurant with his wife when he was approached by two teenagers who demanded cash or his cell phone. The shortstop said he didn't have either and the teens then shot him in the leg. Estrada's wife was unharmed. "I didn't have it on me, so I got shot," Estrada told ESPN's Marly Rivera. "The good news is, all is well," Boone said, according to Brendan Kuty of NJ.com. "He's here. He's doing well. It's not going to be a long-term thing, we don't think. He's been working upper body. We expect him to start progressing to the [exercise] bike by potentially next week. ... But he's doing well mentally, emotionally. He's making progress everyday. He's in a pretty good frame of mind right now." Rivera said Estrada, according to an ESPN source, was shot in Bejuma, Estado Carabobo. She said he spent three days in a hospital and had surgery following the incident. The teens, Rivera said, were 15 or 16 and that Estrada didn't know who they were. Boone told reporters that Estrada would be ready after Opening Day. The bullet, Estrada said, is still in his hip. He said he doesn't believe it'll need to be removed. "I don't think it will affect me at all," he told Hoch, who said no further surgeries are scheduled. Estrada was added to the Yankees' 40-man roster in November to protect him from the Rule 5 Draft. The 2017 Eastern League All-Star hit .301 with six homers, 48 RBIs and eight stolen bases in 72 games with Double-A Trenton before earning an invitation to the Arizona Fall League, where he was named to the All-Prospect Team and voted a Rising Star. 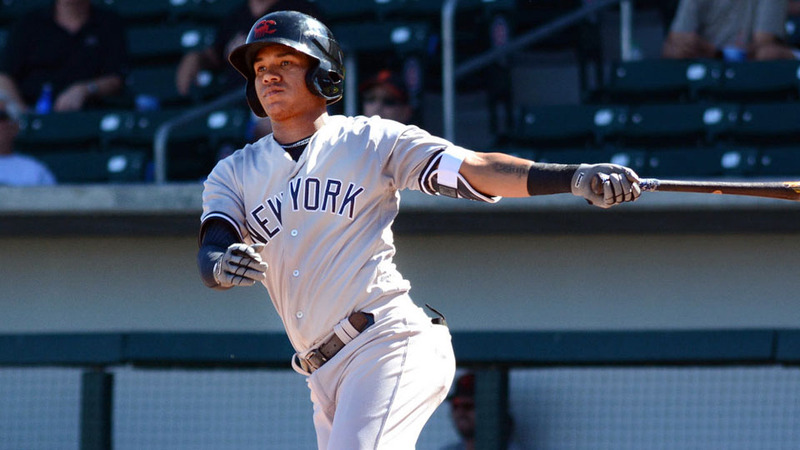 He was honored by MiLB.com as a Yankees Organizational All-Star each of the last two seasons.